Constance Whitney Warren’s intricately detailed sculpture of a bucking bronco and a steadfast cowboy in wool chaps was the first sculpture installed on the grounds of Oklahoma’s State Capitol. 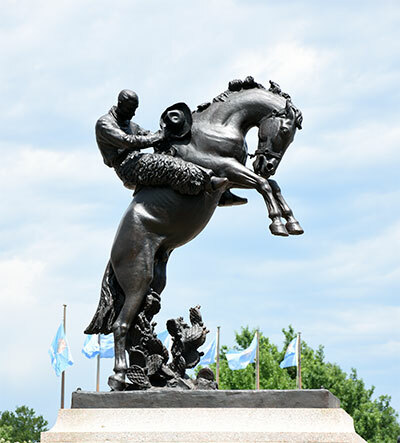 Known as “a bronze tribute to the romantic riders of the range”, the sculpture represents Oklahoma history as seen through the eyes of the cowboy that rode across her land on his trustee steed. The sculpture was officially dedicated 27 years later by Governor Raymond Gary on November 14, 1957. Born and raised in New York, Constance Whitney Warren became fascinated with frontier life at an early age. Her father, Henry Warren, would often tell her stories of his days as a mining engineer in the American West. Consequently, as a young schoolgirl she would go on to fill her notebooks with drawings depicting various animals - most prominently horses. In 1911, while pursuing her career in art, she made the acquaintance of the French Count Guy de Lasteyrie. One year later she became his wife and made a new home for herself in Paris. World War I created numerous hindrances for Warren. Unable to make a living as an artist, she took odd jobs chauffeuring English staff officers. When the war finally ended, Warren was able to fully devote her time to sculpting, even exhibiting a few pieces at the Paris Salon. In the 1920s her reputation had grown, particularly in the United States. The state of Oklahoma eventually acquired her Tribute to Range Riders in 1926. Slightly smaller than life-size, the work proudly stands at the entrance to the State Capitol. Warren died in 1948.